A couple times this year I've wanted to plug some electronics into a hotel TV. For instance, when I'm on the road and want to watch a movie from my Creative Vision M. I also unexpectedly came into possession of an XBOX 360 during a recent trip to Seattle (thank you, Party with Palermo and PreEmptive). The last couple hotel TVs I've looked at offer no media inputs on the front. No problem, I'll think to myself. If there are no inputs on the front, there must be inputs on the back. Getting to the back of a hotel TV, however, is a problem. You see, here in the United States a television is a prized commodity. Watch carefully next time you see news footage of looting in the U.S. After a natural disaster, you won't see looters plundering grocery stores for canned food and bottled water, but you will see them carrying 32 inch televisions through streets of rubble. As soon as electricity is restored, American Idol can alleviate the dehydration and malnourishment. To protect their assets from rogue bands of Idol depraved looters, hotels lock their TVs into place using the strongest, heat-tempered metals known to mankind. Depending on how the TV is mounted, it's often physically impossible to look at the back of a television. No problem, I think, I'll reach around and take a picture of the back, and find some inputs. 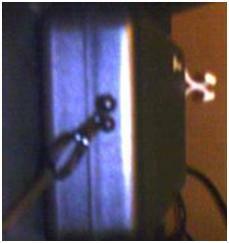 The proverbial "black box" is here, bolted onto the TV. All inputs are hard wired. I think the plastic twisty thing is some sort of tamper detection "seal". Turns out hotels don't want you to watch movies unless you watch their pay-for-view movies. If this TV was a Visual Basic class, it would have the MustNeverInheritOrOverideAnything keyword attached. Enjoyed your post. A couple years ago, I worked as a contractor to the largest provider of on-demand movies, music, and games for the hotel industry. Most likely you're dealing with one of their sets. The TVs, remotes, and infra-red keyboards are not owned by the hotel, nor serviced by hotel employees. They are owned by the on-demand movie company. The company specifically orders/builds sets to discourage ad hoc connections, and uses a proprietary/nonstandard protocol for their TV remotes. This discourages people stealing TVs and their associated remote controls. Hey, when your company owns more than a million TV sets, a 1 percent theft rate is significant. Yikes...time to find a new hotel chain. Use the points up and go somewhere else. Often you can call up one chain and they will give you the same status you have with another chain so you can continue earning points at the same gold/silver/platinum rate. When on the road I used a cheap PCMCIA tv card allowing me to use my laptop as a tv... Albeit no HD, it was enough to get a little 360 gaming fix.